In each case, the homogenates were subjected to high-speed centrifugation and the supernatant/pellet fractions were resolved separately by SDS-polyacrylamide gel electrophoresis. The gels were blotted and probed with an antibody raised against RMAS. I am specifically stuck on explaining the effect of the 0.5M urea vs 5M urea on the soluble and insoluble proteins represented by the pellet and supernatant respectively. My thinking is that at low urea concentrations (0.5M) the pellet protein is destabilised by urea and solubility increases showing a band. However, soluble proteins are denatured and show no band. 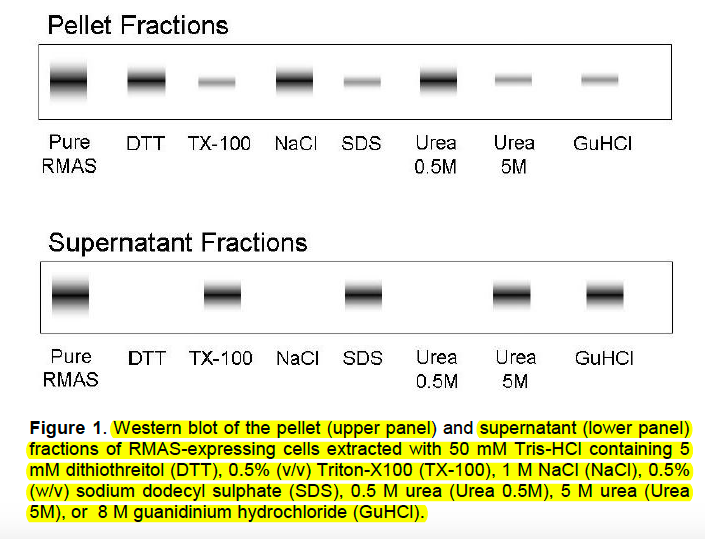 However, at 5M urea, the pellet proteins are reversibly soluble and therefore do not show as a band whereas the soluble proteins are OK and so show a 'normal' band. I don't know if this is the right explanation, so could someone please explain it to me?? What you need to do is compare the relative amounts of the protein in the insoluble (pellet) fraction to the soluble (supernatant) one. This way you can determine how soluble the RMAS has become through the effect of the indicated compound. DTT breaks disulfide bonds, but does nothing else to solublize the protein, so it's all in the pellet, with none detectable in the supe. NaCl is a salt that increases the ionic "strength" of the lysis buffer, but doesn't really do anything to solublize the protein, so again all of the target stays in the pellet. On the other hand, detergents like Triton and SDS free the protein from the insoluble fraction and move most of it into the supernatant, leading to the pattern you see for them. Depending on the exact subcellular localization of the protein of interest, and the amount and combination of detergent(s) used, you may see essentially no protein at all in the pellet, as it has all been solublized. Urea and guanidinium hydrochloride are chaotropic agents, disrupting hydrogen bonding, van der Waals forces, and weakening hydrophobic associations, causing the protein to denature and separate from other proteins in the pellet, thereby putting it into the supe. This effect is generally seen at relatively high molarities (e.g. GuHCl is often used in the 6-8 M range), which explains the difference in effect seen with 0.5 and 5 M urea. At low concentrations, there is just not enough urea present to effectively denature the protein. I am a little surprised that nothing showed up in the 0.5 M lane, however, this is just a simulated Western showing ideal results - in real life things are almost never quite this cut-and-dried. Not the answer you're looking for? Browse other questions tagged proteins homework protein-binding protein-folding protein-interaction or ask your own question.